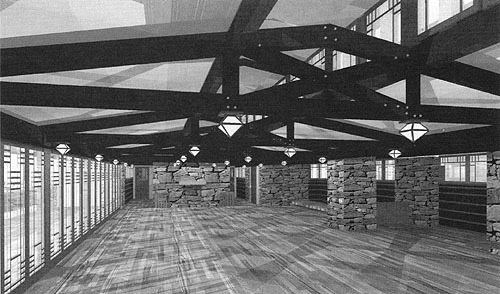 "Frank Lloyd Wright’s Banff Pavilion: Critical Inquiry and Virtual Reconstruction. Using historical research and advanced computer technology, a long-forgotten Canadian structure, demolished in 1938, was described, its design and construction analyzed, and a 2D/3D model created." Brian Sinclair and Terence Walker produced an in-depth analysis, from original drawings, and created a 3D computerized model. They wrote one of the most complete description of the construction of the Pavilion. Published in the APT Journal, Vol. 28, No. 2/3. 1997.